In the Tool Properties view, set the Maximum Size to the desired brush size. NOTEIf you are drawing with a mouse, your strokes will always be at their maximum size. If you are using a pressure-sensitive tablet, your strokes will vary in size depending on the pressure of your pen, ranging between 25% to 100% of the maximum size. You can hold Ctrl (Windows/Linux) or ⌘ (macOS) while drawing to force your stroke to be a closed shape. 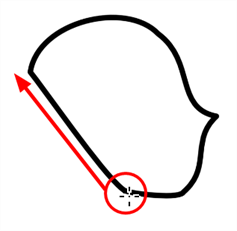 This will automatically draw a straight line between the beginning and the end of your stroke.